The Wayne Home Equipment Company was started in 1928; they were located in the second largest city in Indiana. The company started out manufacturing lawn mowers and refrigerators. It wasn’t until the 1940’s when Wayne started with water pumps. The company has been in the swimming pool pump industry for over 60 years. They also have an extensive line of sewage pumps, lawn pumps and sump pumps. There are two different models in the Wayne Swimming Pool Pump Line, the WIP100 and the WIP150. When you order a Wayne Swimming Pool Pump you will need to know which horsepower you will need. The horsepower that you will need will depend on the size of your swimming pool. 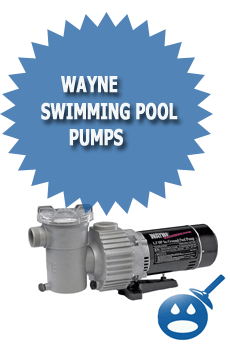 If you are attempting to replace a swimming pool pump then use the same specifications to size up your new Wayne Pump. The Wayne Swimming Pool Pump Model WIP100 is a one horsepower pump. It is rated at 6200 gallons per hour at a five-foot head. The pump housing is made from a reinforced Thermoplastic for both In-Ground and Above Ground Swimming Pools. These pumps are self-priming pumps with an extremely efficient dual voltage motor, which is 120/240 vac. It is factory wired for 240 volts. The WIP100 Swimming Pool Pump has a large capacity strainer basket with a clear view lid for easy cleaning. It has a standard 1-1/2 NPT Suction and Discharge for easier installation. Model WIP100 at a 20-foot head can work 5520 gallons of water per hour. This Wayne Swimming Pool Pump Model WIP 150 is a 1-1/2 horsepower pump. It is rated at 6800 gallons per hour at a 5-foot head. Like the WIP 100, it is a self-priming, high efficiency dual voltage motor which is factory wired at 240 volts. The WIP 150 has a larger capacity strainer basket to catch more dirt and debris than other swimming pool pumps. The Pump is also made from a reinforced thermoplastic. The WIP150 is a 1-1/2 horsepower pump that at a 20-foot head will have 6120 gallons of water per hour. These motors are self-lubricating and there won’t be any oil that ever needs to be filled. As you are cleaning out the swimming pool strainer basket it is important to clean out all hair and lint that may become entangled in the pump. 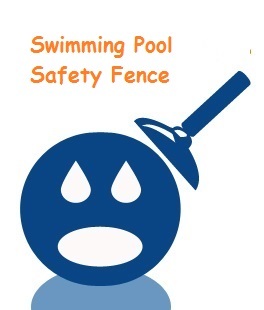 When you install these pumps, it is important to remember that the pump should be installed into a solid and level surface as close to the swimming pool as you can. The pump should be placed in a dry and a very well ventilated area where the pump will not come into contact with direct sunlight. The Wayne Swimming Pool Pumps should be installed below water level for maximum priming. It is recommended that the electrical wiring should only be performed by a licensed electrician. Attempting to wire the pump yourself may cause some damage if you are not familiar with what you are doing. By causing any damage while attempting to hook up the WIP 100 or the WIP 150 may void the warranty so make sure that you read the warranty as well. What makes Wayne Swimming Pool Pumps so great is that their manuals contain all of the information that you will ever need. These manuals cover everything from Trouble Shooting Guides, Maintenance, Parts List and Installation Instructions. It is very important to read all of the warranty information as well as the install manuals. It is also very important that you choose the Swimming Pool Pump that best suits your swimming pool. You want to make sure that your pump is big enough to accommodate the entire swimming pool. Log onto the Wayne Pump website and look for a distributor. If you plan on shopping the web, you can search for a great deal on either pump. If you have any questions about the Wayne Swimming Pool Pump you can contact them via phone, email or by filling out the contact form on their website. Even if you haven’t bought a pump yet or they can tell you where to buy the pumps and answer any questions you may have. I recently discovered the link: “http://waynewatersystems.com/index.cfm/page/wheretobuy”….I put in my zip code and got locations that supply wayne pumps and parts…I will be visiting some of them tomorrow to see if they can help me…give it a try and see if there are suppliers close to you. Today I actually found a place that can order the part for you. It is Lowe’s. 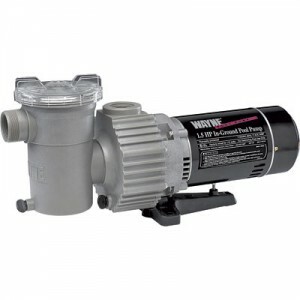 They don’t carry the Wayne pump anymore, but sell the Utilitech model # 0313504 replacement. However, the Lowe’s associate called the supplier and was able to order my replacement lid. I have the Wayne model WIP 150. The replacement part according to the sales associate is Model# 69010-001, and sos# 213851. If your Lowe’s can’t figure it out, I was told by one of my pool supply stores to bring my part in and they would try to match it up with one of their inventory parts. I went to other places prior to Lowe’s and discovered that the Wayne website obviously hasn’t been updated for some time. Several of the places I went had no clue to what I was asking for and didn’t carry anything remotely like a Wayne pump. I would encourage you if you need to replace your pump to go with the industry standard Hayward pump and parts. All pool supply stores carry the Hayward parts line and are easy to get replacement parts. The Wayne pump works great, but getting parts is a nightmare and time consuming. I wouldn’t recommend using the Utilitech replacement either. It appears you would end up with the same logistical challenge if you needed parts. If you are looking to save money you may try ebay for the Hayward pump replacement. Don’t try finding the lids for Wayne pumps on ebay, I’ve already tried, not happening. Good luck and give your local Lowe’s a visit but make sure you get the right cover for your particular model, and make sure the associate knows you want the “WAYNE” model replacement, not the Utilitech. The Lowe’s price for the clear view lid part is $21.32. I stand corrected after ordering from Lowe’s. The quoted price was the store’s price. My price was $32.80 plus tax. However, the part will come to the store and I won’t have to pay $35.00 plus the shipping and handling fees mentioned in the response from the Wayne representative. Still better to order from Lowe’s and not incur the extra charges. I ordered two lids to have a back up for the future, and not have to go through this process again for a while. I get the impression these parts are going to become discontinued in the next year or two, you all may want to prepare for a pump conversion in the near future. I stand corrected again…Lowe’s called me today to inform me that they overcharged for the clear view lids and refunded me the difference. The original quoted price was indeed the correct price, $21.32 plus tax. Therefore, Lowe’s definitely is the place to get these parts versus the manufacturer with the additional charges for shipping and handling. Get’em while you can. I have the same probem anyone able to tell me where to find these lids? Tyvm been hunting them down myself with no luck. Thanks for the info. Much appreciated now. We have them (p/n 69010-001) for $35.00 + shipping and taxes. For further assistance please call (800) 237-0987. Please have your model number, serial number and a copy of your dated receipt available. I just wanted to add that I too had a problem with my lid cracking this year on my Wayne Motor (I bought last year). After reading all of your posts I went my local pool store to shop and compare pricing. The pool store told me that they had never heard of a “Wayne” brand pool motor! (they had soething comparable for $45 plus tax). I went to Lowes and they ordered my replacement lid for 21.33 plus tax! I ordered two! My strainer lid ‘exploded’ exactly 2 years after purchase. I took the advice to go to Lowe’s. I called Wayne Pumps # and was told $27.99 plus $6 shipping. Saw them on Ebay for $39.99 plus about $15 shipping. Lesson learned…buy Hayward…as my old one was 10+ years old and don’t remember replacing it.